Stop the Burning - It's Killing Us! Rotary International President Elect Ian H.S. Riseley recently made an appeal to Rotarians around the world to be guardians of our environment. Here is Thailand we know well the costs of environmental betrayal through ignorance and more recently corporate greed, especially when it comes to crop management. As Rotarians, our purpose is to provide humanitarian services, encourage high ethical standards in all vocations, and to advance goodwill and peace around the world. Sure we can plant a few trees, but frankly that’s not enough. What if we can save children’s lives my cleaning up the air they must breathe? It will be difficult, it will be frustrating and it will be expensive, but we can do it! We must do it or we will perish; not today, but in less time than our politicians apparently believe. 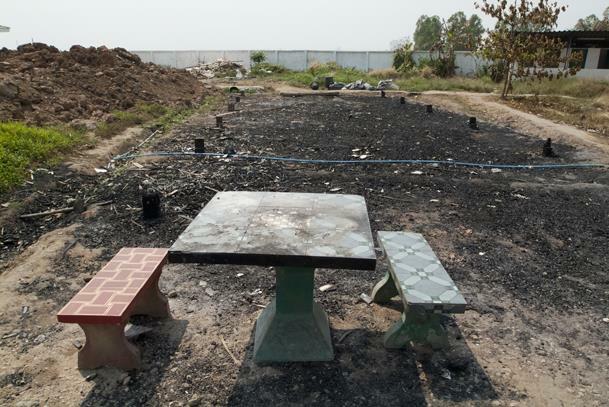 This is a photo of all that remained after a fire destroyed the boys’s dorm at the Mae Tao Clinic. The fire was started by a farmer burning crop waste. Bad management, bad wind and presto 70 plus migrant boys have no place to sleep. Many of the boys lost all they owned, including their documentation which permits them to be in Thailand! The only good news was that because they were in school, no one was killed! Three months of the year, Chiang Mai is uninhabitable. The annual “burning season” blankets the Thai North with a deadly fog that kills thousands, puts tens of thousands in the hospital and costs Thailand billions of dollars in healthcare and lost revenue. The problem is not hard to understand. There is a lot of stuff to burn and between January and March most of burns producing lots of smoke. The question is: How to stop the burning? The answer is to change people’s thinking, which requires that we start by asking: Why do people burn? People burn forests to make it easier to find precious wild mushrooms for global markets. Forest fires account for a lot of our annual smoke. But a big part of our smoke comes from farmers burning crop waste in their fields because burning is easier than chopping it down or digging it up. How much smoke are we talking about? Suppose we just look at corn and rice. Together they produce 11,056,000 metric tons of waste annually just in North Thailand. Government estimates that between 50% and 90% is burned. If we take the 50% figure, 5,528,000 tons of waste is burned annually. Burning one ton of waste produces 6.26 kg (13.8 lbs.) of smoke. Burning 5,528,000 tons produces 34,605,280 kg (76,131,616 lbs.). What’s this, you ask? One kilogram of smoke is the equivalent of the smoke of 71,429 cigarettes. 34,605,208 kg of smoke is equivalent to 2,471,820,545,120 cigarettes. Biochar their crop waste – turn it into “super charcoal” which they can combine with mulch, compost or manure and add to their soil. 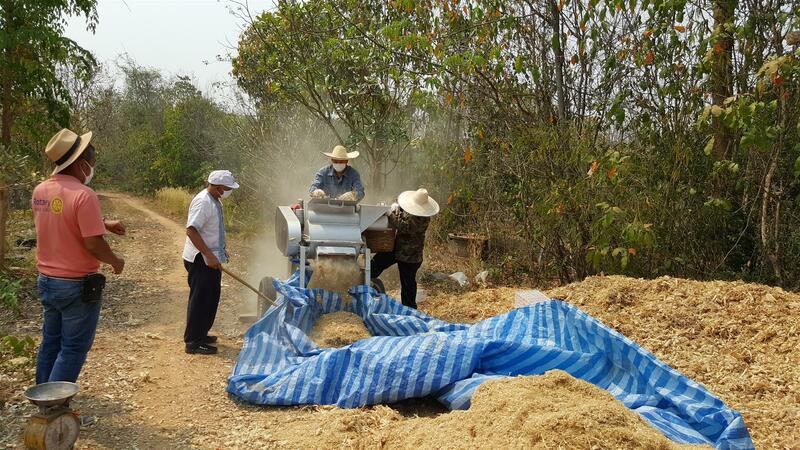 The Warm Heart Environmental Project develops new, inexpensive biochar technology and fertilizers for poor farmers. Aided by the development of a simple technique for enhancing compost quality at MaeJo University, many farmers are today experimenting with transforming crop waste into compost. With equipment designs and training from the Warm Heart Foundation, still other farmers are converting their crop waste to biochar and returning it to their soil, often mixed with enhanced compost or manure. Warm heart is working with Chiang Mai University. 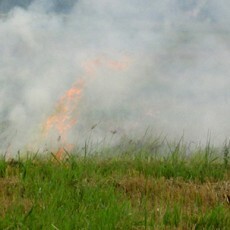 All three approaches offer great advantages to small farmers, but they will also just begin to solve the region’s smoke problem. These approaches provide the only means available to change the behavior of the large number of small farmers whose smoke contributes to the annual smoke crisis. Such small-scale solutions must, however, be complemented by government efforts to regulate the mushroom market to reduce incentives for forest burning and by large-scale solutions to huge smoke sources as the two sub-districts in Mae Chaem District, which grow so much corn that they burn 95,000 tons of waste annually. Stop the Smoke! is an online crowdfunding campaign to remove smoke from our skies by paying farmers to produce biochar, each ton of which effectively eliminates 31.3 kg of smoke. Donate directly to https://www.crowdrise.com/stop-the-smoke. 100% of your donation goes to the purchase of biochar from farmers.